Parsley, Sage, Rosemary and Thyme… as the song goes in Scarborough Fair/Canticle released by the duo Simon and Garfunkel in 1966. This ragout pays tribute to one of the most influential music groups. 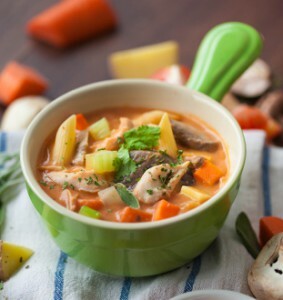 Notably rich and creamy, this stew is filled with marinated chunks of chicken that is cooked together with 6 varieties of mushrooms and the infamous foursome herbs known for its mood enhancing, cleansing and antioxidant abilities. Chicken stock (water, chicken, root vegetables, herbs), marinated chicken, carrots, potatoes, cream, whole peeled tomatoes, celery, tomato paste, abalone mushrooms, button mushrooms, oyster mushrooms, enoki mushrooms, portobello mushrooms, shiitake mushrooms, onions, penne pasta (durum wheat), garlic, sugar, balsamic vinegar, Worcestershire sauce, salt, sage, rosemary, thyme, parsley, vegetable oil and bay leaves.